God of compassion, we thank you for Brother Roger’s life. In a world often torn apart by violence, he wanted to create a community that was a parable of communion. 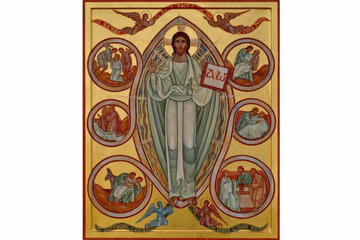 We praise you for the witness he gave to the Risen Christ and for his faithfulness until death. Send your Holy Spirit upon us so that we too may be witnesses to reconciliation in our daily lives. Make us creators of unity among Christians when they are divided, and bearers of peace among human beings when they are in conflict. Enable us to find ways of living in solidarity with the disadvantaged, whether close at hand or far away. 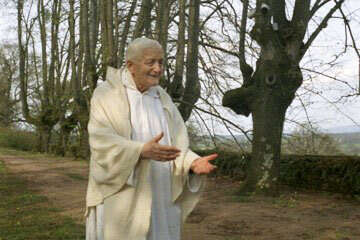 With Brother Roger we want to say to you: Happy all who surrender themselves to you, O God, with hearts that trust. You keep us in joy, simplicity and mercy. Over these past three years, our “pilgrimage of trust on earth” has been nourished by listening to young people from every continent who are seeking a “new solidarity”. They have shared their experiences and reflections during meetings at Taizé, in the course of visits to many countries, and during gatherings in Europe, Africa, South and North America, Asia and Oceania. From Taizé, we greet all those who, across the world, have taken the risk of hope. They are longing for a globalization of solidarity, and they are already living it. With them, we want to take a further step on this road together. Across the earth, new calamities, new forms of solitude, new and burning issues—displaced populations, ecological catastrophes, inequalities, massive unemployment, different forms of violence—call for new expressions of solidarity. They represent a common challenge for believers of different religions as well as for non-believers. that solidarity may not be a one-way process but a reciprocal relationship, and that those who give may learn to discover the generosity of the weak, the poor, of foreigners. Even with next to nothing, you can contribute to creating these new forms of solidarity so that together we can attain the joy of living. Do you believe this? Where will you find the strength you need for this? For years now the awareness of Christians has been awakened, and they have realized that Christ came to bring together all human beings: by his resurrection he made them brothers and sisters of the same family. By coming together visibly around him, by letting themselves be led by the breath of the Holy Spirit, Christians will permit the wellsprings of compassion and solidarity to flow. By drawing from them, they will be able to set out ever anew. If compassion were to disappear from our societies, what would become of humankind? joy – simplicity – mercy. During the next three years, could these three words accompany you on your journey, helping you to open wide the doors of solidarity—in your heart, around you, and in society? In 2016, we shall begin with mercy! Let us rediscover God’s goodness and human goodness; they are deeper than evil! In this way, we reach the heart of Christ’s message. It is in this spirit of the Gospel that Pope Francis has launched a year of mercy: all are called, through their lives, to reflect God’s forgiveness and unlimited compassion. Will you devote your energies to helping your neighbor, to repairing injustices? Christ is present in the wounded man abandoned on the roadside; he is waiting for your compassion. Are you yourself undergoing a trial? Christ looks at you with kindness. He takes care of you as he does of all humanity. His look of love is sometimes revealed to you by someone who is despised, like this stranger, the Samaritan.